This blog is an attempt to do something different as to how Rugby is thought and discussed, analyzed and debated. I write as a fan, a critic, an (often overly) enthusiastic spectator and also as an academic who teaches and writes on sport. It is written for all of us who wish to read and discuss more than the usual platitudes, banalities and generally limited thinking and discussion that all too often seems to occur. Cricket has a rich history of intelligent, perceptive writing, as does Baseball. The writing on both sports transcends the limitations and superficialities of much Rugby writing, yet there is no reason why this situation should continue. Likewise Football has a enviable literature that places the game in a wider context. Of course there is writing on Rugby that we have often forgotten and part of this blog's aim is to discuss such books and other sports books and writings that help s think about rugby and being a fan. In this blog I also aim to cover the 2013 season,writing about rugby as experienced live from my season ticket holder 'take a kid to footy' seats here in Christchurch where we sit three rows back from the opposition benches, and on TV from the couch in the lounge where increasingly most of us watch our wider rugby. This blog takes its name from one of my favourite books, Fred Exeley's A Fan’s Notes. A Fictional Memoir (New York: Harper & Row, 1968). 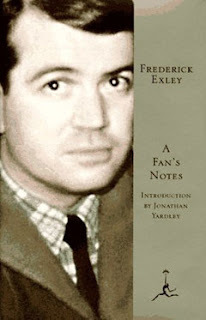 Exley's novel of the intersections of fandom, American Football, alcoholism and madness contains a statement that for me sits at the heart of what sports - and in particular, Rugby - can offer. “The giants were my delight, my folly, my anodyne, my intellectual stimulation …an island of directness in a world of circumspection…a life-giving, an exalting force”. [ John Mulgan, Report on Experience (Auckland: Oxford University Press, 1984) 7]. What this means is that in rugby time speeds up and slows down, everyday time is forgotten and we became caught up in the drama unfolding before us.